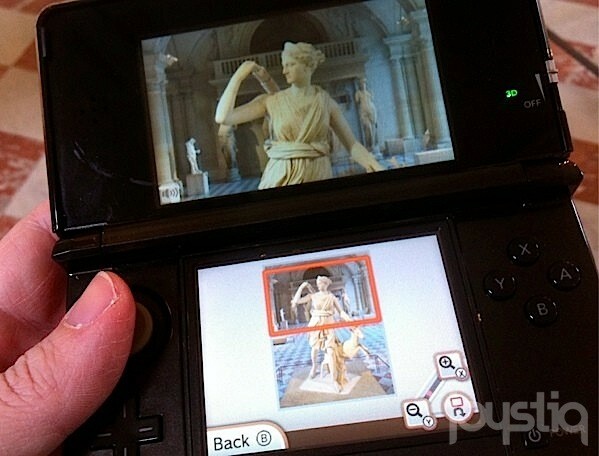 The Nintendo 3DS debuted in its latest occupation last week, as tour guide at the biggest and best museum in the world, Paris' legendary Musée du Louvre. I just happened to be in the neighborhood this week while on a month-long trek across Europe, so I paid my 5 € along with the 10 € museum admission for the audio guide, and was handed a Korean Air-branded black 3DS and a pair of headphones on the way to go see some of the world's finest art. 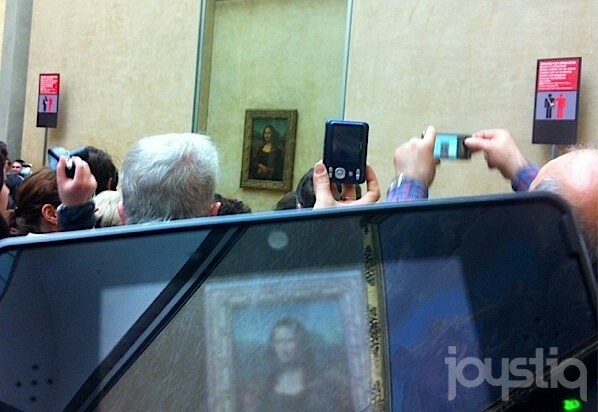 The 3DS isn't the only portable device in use as a museum tour guide. While visiting the Musée d'Orsay last week, I was handed an iPod touch in a special security case, and walked around among the works of French impressionists while using Apple's device to hear insights in English. And I've used quite a few other audio guides on this trip – in London, Westminster Abbey and the Royal Observatory both used custom-made audio guide systems, with a keypad and a play button to choose certain audio tracks for various sights on the tour. But the 3DS was definitely the only gaming-specific device I've seen in use so far. And because of all of the various technologies included, specifically the wireless features, it actually did a great job. I'm not sure if the tour used the same tech behind the 3DS's StreetPass connection, or just plain Wi-Fi, as I walked around the Louvre, but I do know this: It knew where I was. The installed cartridge (and by installed, I mean it's screwed into the unit with a custom fitting) opens up with a quick instruction sequence, and then spreads a map of the entire gigantic museum in front of you on the touchscreen. It constantly centers in on wherever you go, offering up audio insights and commentary on any works that happen to be around you. You can browse the museum via the 3DS in three ways: The interactive map (which is the main way I accessed information from the unit), a "Masterpieces Tour", or a feature called "Visit a must-see work." Just inside the museum entry way, I chose the Masterpieces Tour, and the 3DS started playing a tour that took about an hour and a half, leading me through the museum to see a few of the most famous works on offer. The Masterpieces Tour is actually very well done. There are a number of various tours available, either in person or via podcast or even in printed books (I also took Rick Steves' podcast tour, and it showed a lot of sights that the official tour didn't), but the 3DS kindly keeps up with you as you go, playing audio directions and art commentary only when you've reached the room it's talking about. I tried to trick it at first, walking in the wrong direction to see if it was just timed, but no -- the 3DS still knew where I was, and correctly guided me around the museum to see works like the old Louvre palace, the gorgeous Venus di Milo, the incredible Victory at Samothrace, and Leonardo da Vinci's Mona Lisa. 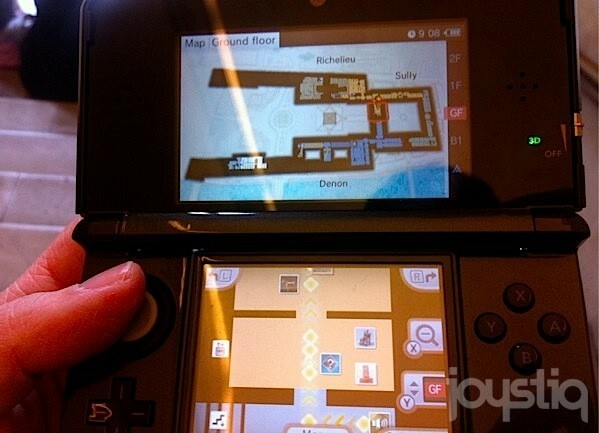 Each point of interest on the 3DS' map has at least one bit of audio commentary on it, and sometimes more than that, with various museum officials or professors talking about the work in more depth. Some of the audio clips also use the top screen itself to show off comparable works, or sometimes show works that influenced the one you're seeing in the museum, or vice versa. There are hours and hours of audio to listen to, about all sorts of displays in the museum. Each work also offers up a high resolution picture of itself on the top 3D screen, which you can zoom in and out of using the bottom touchscreen. This is helpful for paintings, as it allows you to look at details, though those aren't shown in 3D, obviously. Sculptures do include 3D pictures that you can zoom in and out of, but none of the exhibits I looked at were actually modeled in 3D, so you couldn't spin them around or rotate them as you like. There were a number of 3D shots to browse, however, both close up and from a far angle, so there were lots of ways to examine the works, besides, you know, looking at them right there in front of you. After the Masterpieces Tour was done, I spent the rest of the day wandering the museum on my own, and the 3DS was helpful the whole time. Pieces in the museum with audio commentaries have tags on their cards, so you can just punch those numbers in to hear what the museum has to say about the work, or pull up that specific commentary by browsing to it on the interactive map. I also just wandered – sometimes I'd walk into a room, wonder if there was anything to listen to in there, and I'd crack open the 3DS, find a work nearby, and start listening to the commentary while I hunted for it. Finally, the 3DS also offers a "must-see work" feature -- if you're entirely lost as to where to go, it'll choose a work for you, and give you a flashing route line directly to that work so you can learn about it. The biggest drawback of the whole experience was the battery – my unit died a couple of hours into my visit, so I had to trek back to the front of the museum, where it was kindly exchanged without issue. The wireless technology also sometimes mixed up what floor I was on. The units they're using to identify rooms are probably in the ceilings or floors, so occasionally the 3DS would think I was in a room below when I wasn't. Searching for an artwork is included as a feature, but is so far listed as unavailable, so if there's something you specifically want to see you'll have to find it some other way. And while the guided routes are helpful (the 3DS will even give you a route to turn it back in when you're completely done), the interactive map is sometimes hard to read. Usually, when I was traversing the museum, I'd accidentally wander off the route it gave me and have to backtrack until I'd caught up. The other big issue I had was that the audioguide itself is obviously static, and the museum is always changing. Some of the works listed on the map were moved or removed from their places (either for cleaning or to be placed in other exhibits or other museums), and it was frustrating to see that a piece by Raphael or an old Egyptian statue was supposed to be right there when it wasn't. But that's a consequence of the Louvre in general – it's such a big collection that it's not a surprise the 3DS can't quite keep up. Still, it was well worth the money I paid to rent it (and the California driver's license I had to deposit while I used the unit). The 3DS comes with a strap for hanging around your neck, and I had quite a system going all day, just wandering the wide expanses of art, grabbing the 3DS when I found something interesting, and pulling up the extra commentaries and insight on what I saw. This isn't the last we'll see of dedicated gaming devices being put to work in nontraditional settings. These little computers are so powerful and feature-filled these days (not to mention relatively cheap to use and develop for, compared to custom-made audioguide systems) that it's not surprising museums like the Louvre are depending on Nintendo's hardware for educational solutions. When organizations need a touchscreen-accessible, location-enabled, powerful portable device to deliver all of this content with, the 3DS turns out to be an obvious choice.